Last updated 07 December 2018 . By Georgia Evans. 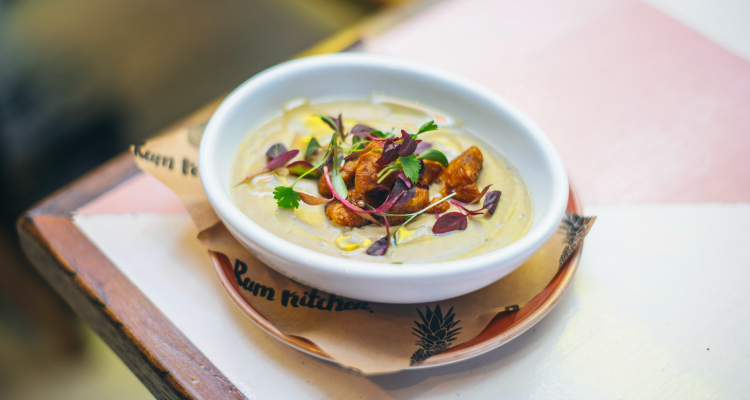 Tucked away from the hubbub of Carnaby Street, Rum Kitchen is giving Londoners the essence of the Caribbean. To any passerby it would seem the party is always in full swing, with blaring music and flowing cocktails. Upon hearing they’d launched a new vegan menu created by chef Shivi Ramoutar, I, the resident herbivore, decided it was time I went to investigate whether the food was just as vibrant as the atmosphere. The wonderfully colourful cauliflower soup. I opted for the Curried Cauliflower and Coconut Soup (£5.50) to start off, with a deliciously delicate earthy flavour complemented by a slight heat from the spices, a real treat made better by its vibrant yellow colour. I finished this within minutes, feeling comfortably full as I sipped away on my gloriously fruity, Gatorade-blue Rum and Ting (£5 during happy hour). We then moved on to bigger plates, sharing a Krispy Fried Cauliflower (£8.50) and Jack Fruit Bowl (£11). The cauliflower was delicious, and I must admit I was hesitant, but it had a lovely crispy batter and soft inside. My only criticism would be that it was served on a bed of sweet potato, making it a little dense, so it would've been nice to have a different texture. 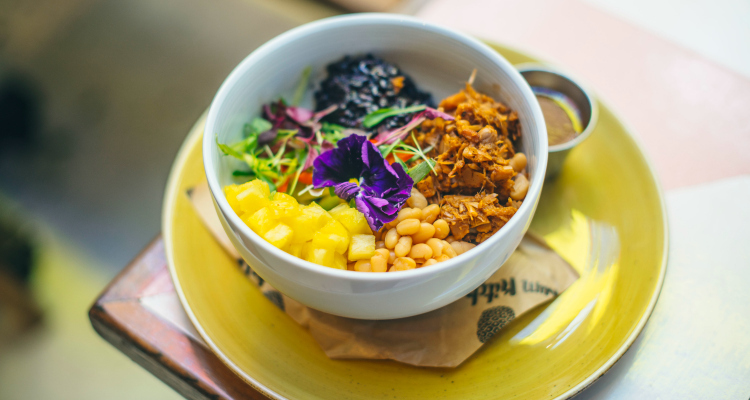 However, the Jack Fruit Bowl was a beautifully colourful pate, with different flavours coming together in harmony. The sharp citrus taste of the pineapple perfectly contrasted to the heat from the jerk gravy. A rainbow on a plate? Nope, it's just the Jack Fruit Bowl. Head to Rum Kitchen if you’re in the mood for a little extra something to warm up your winter frolicking. There's always a party vibe, with cocktails on hand and a menu of flavoursome dishes that pack a punch. To sweeten the deal, there’s now an expertly-curated menu of plant-based goodies so everyone can enjoy a taste of the Caribbean.